This week, we published our first special audio series, The Way, about Nick and Wendy’s recent journey on the Camino de Santiago. But what exactly is the camino? The Camino de Santiago – known as The Way of St. James in English – is a medieval Christian pilgrimage1 trail leading to the city of Santiago de Compostela in northwest Spain. Part of the cathedral of Santiago de Compostela, where the relics of the apostle James are held. 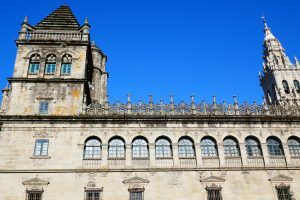 In the middle ages2, Santiago de Compostela was one of the three major pilgrimage centres for devout3 Christians, along with Rome and Jerusalem. Pilgrims travelled on foot from their home towns to the Galician city to see the relics4 of the apostle James, who gives the city its name (Santiago is Spanish for St. James). The relics of St. James were discovered in the area in the late eighth or early ninth century. At the time, most of the Iberian peninsula (modern Spain and Portugal) was under Muslim control, following an invasion from North Africa in 711. However, some parts in the far north of the peninsula were never conquered by the invaders, and in these Christian lands, the first pilgrim trail from Oviedo to Santiago – the Camino Primitivo, or Original Way – was quickly developed. The king of Asturias (one of the early Christian kingdoms that developed in the north in the aftermath of the Muslim conquest) was said to have made the pilgrimage himself in the year 814 as the first pilgrim. 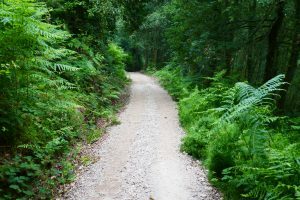 The Camino de Santiago in Galicia, not far from Santiago de Compostela. Throughout the medieval period, and especially once more Muslim territory in Iberia was reconquered by Christian kingdoms, other trails to Santiago were established. These included the short Camino Inglés (English Way), for pilgrims arriving in A Coruña by boat from the British Isles and walking the rest of the way to Santiago, the Camino Portugués (Portuguese Way), which heads north to Santiago from Portugal, and the Camino del Norte (Northern Way), which makes its way along the Spanish coast. The most common and famous route, however – both in the middle ages and today – is the Camino Francés (French Way), which heads west to Santiago across northern Spain from the Pyrenees mountains. It gets its name from the fact that various different pilgrim trails going through France joined up just before the Pyrenees in the French village of Saint-Jean-Pied-de-Port and merged5 into one major trail for the remaining 799 kilometres to Santiago. 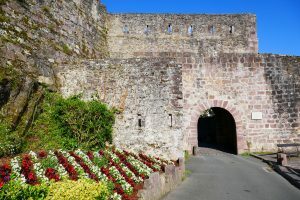 A city gate in Saint-Jean-Pied-de-Port, the unofficial starting point for the Camino Francés. The Camino Francés is the trail that we decided to walk for our first – but hopefully not our last! 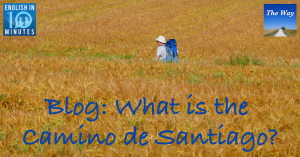 – experience on the Camino de Santiago. 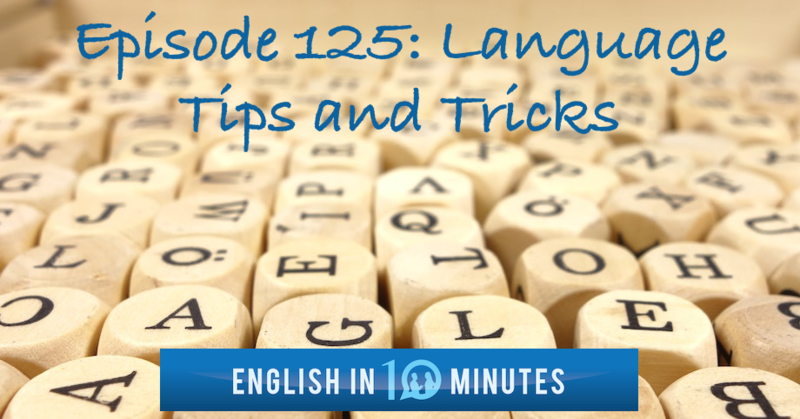 It was an amazing journey for many reasons, and in The Way, we talk about both the hardships6 and the rewards of this journey in 11 new podcast episodes featuring our famous real and unscripted English conversations. To find out more about this special series, including how you can listen to it, click here.